Modern offices are usually focused on functionality and organization, but using an antique office desk chair can add charm that new pieces simply don't have. That said, an antique desk chair paired with a modern desk might look a little disjointed. For a truly good-looking office, pair antique office chairs with antique desks, filing cabinets, and other furniture. Antique chairs are charming and look great but they're not always as practical as modern office chairs. They generally don't have the height adjusters, wheeled casters (although these can be added if desired) or the same swivel and pivot abilities as modern versions. Modern office chairs are often designed with ergonomics in mind. People spend many hours a day in them and they need to provide the proper support. They rotate, swivel, and can recline and adjust in order to provide maximum support and comfort. Antique chairs do not. At the time when most antique chairs were made (over 100 years by definition) people didn't spend even close to the same amount of time in desk chairs as they do now. Some antique office desk chairs can recline and swivel, but not to the degree that modern ones do. Many of them do have casters as well. The best place to find antique chairs is to visit local antique stores and markets in your area. You should also check out estate sales and auctions if possible. Antique chairs are common and shouldn't be too hard to find. While you're looking keep an open mind and look at chairs that are not necessarily designated as desk chairs. Sometimes other chairs such as fauteuils and klismos chairs can work just as well. Test a few out and see what's the most comfortable. The Internet has a wealth of options for buying antiques. There are companies that specialize in desk chairs, sites that sell all kinds of antiques that will sometimes have office chairs, and online auction sites where desk chairs appear regularly. These are all great options, however there are a few things to keep in mind when buying antiques online. Make sure the seller has a good return policy in case the item described isn't the item you get. Ask as many questions as you can and ask to see pictures that show all angles of the item for sale. One person's idea of condition is not always the same as another's so the description might not always be accurate. Pictures speak more than words ever could. Make sure you know the shipping costs before buying. Shipping furniture can be expensive so know the full cost before you buy. The design and style of antique desk chairs depends both the period and country in which they were made. The price will always be affected by these factors. Generally speaking, the older the item the more expensive it will be. However, this can change if the condition isn't very good. Sometimes you can find antique office chairs for under $100, but they're often in poor (or at least not great) condition. 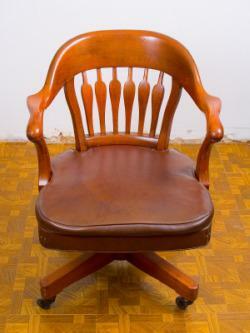 A good quality, real period chair is more likely to cost a few to several hundred dollars (sometimes more). If you're buying an antique desk chair there are a few things you should do to ensure you're getting the best quality for the best price. Look at the actual construction of the chair, not just its overall appearance. Determine whether it is durable enough for actual use, or if it will be a showpiece item of furniture in your home. Make sure the chair components are from the same era as the chair itself. Look for a maker's mark. Marks are often on the underside of chairs. Sometimes the date is even burned into wood or on a paper label that is still attached to the piece. Look for cracks. If the piece is truly old there will likely be a hairline crack or two. This isn't necessarily a bad thing. If it's in absolutely perfect condition it likely isn't a real antique, but make sure that the cracks don't affect the construction or stability of the chair. If it's really in bad shape it won't do you any good and isn't worth buying (no matter how cheap it is!). Antique desk chairs can add real charm and personality to an office. Pair them with other antique furniture and accessories to create an office you'll actually enjoy spending time in.